Norman was an eccentric visionary whose songs drew controversy from both the conservative religious establishment and the secular music press for his lyrical mix of radical religious, political, and social themes. His 1969 solo album Upon This Rock was the first Christian rock record, and his milestone 1972 release Only Visiting This Planet is considered one of the best albums in the genre. Norman was born on April 8, 1947 in Corpus Christi, Texas. At the age of 3 he relocated to San Francisco, California with his family and in the mid-'50s became fascinated with the music of Elvis Presley. During this time he also frequently accompanied his father on Christian missions to prisons and hospitals. At the age of nine, Larry began writing and performing original rock and roll songs at school, experimenting and incorporating a spiritual message into his music. In 1959 he performed on Ted Mack's syndicated television show The Original Amateur Hour on CBS. Upon moving to San Jose, California, he began recording for Capitol Records with his band People! in 1966 and for the next 2 years performed concerts supporting The Doors, The Who, Janis Joplin, and Jimi Hendrix, among others. His solo albums recorded in the 1970s on his own independent label Solid Rock, and the albums of other artists he discovered and produced, laid the foundation for what would eventually become the Christian rock music industry, a genre which largely shunned him and his music. 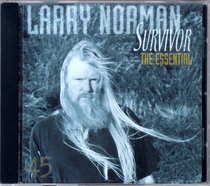 Known as the "father of Christian rock music," Larry Norman died of heart failure on Sunday Feb. 24, 2008 in his Salem, Oregon home. He was 60.